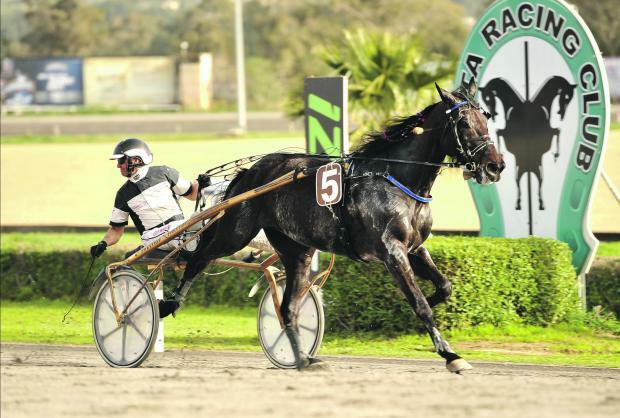 The eighth meeting of the year, made up of ten races all for trotters on a mile distance was held on Sunday afternoon at the Marsa Racetrack. The two most important races were open for class Premier trotters and which were won by Brigadoon and Jaguar Broline. Twelve trotters lined up in the first class Premier race. Here, Swedish Brigadoon, driven by Gozitan Julian Farrugia, was unchallenged during all the distance of the race. This trotter sped past the finishing post first easily by four lengths from M.T. Gogogirl (Nathaniel Barbara) and Uccello Jet (Charles Camilleri). Quiet Du Chene (Mario Fenech) followed behind. Similar was the second class Premier race, in which Swedish Jaguar Broline (Clifferty Calleja) also led all the way and notched its first win of the season from Troll (David Ellul) and Tonio Du Vivier (Charles Camilleri). Favourite Service Secret (Andrew Farrugia) also obtained a good placing when finishing fourth. The remaining races on the card were open for class Silver trotters. The first one was won by Evisir (Redent Magro) which upped its pace in the final metres. Angelus Del Phedo (Raymond Schembri) sealed its first win in Malta in the second class Silver race after sprinting on the outside in the final straight. In the third race from the same category, French newcomer Viking De Braye (Noel Baldacchino) led all the way. Fakir Haleryd (Raymond Schembi) was outsmarted by Danish mare Trytocatchme (Charles Camilleri) 100m from the finishing line of the fourth class Silver race. In the fifth race, Energitj (Kurt Saliba) was unchallenged during the mile distance while in the sixth class Silver race it was Peanut Butter (Noel Baldacchino) which registered its first win of the season after dashing on the outside during the last 400 metres. In another class Silver race, Utian Joy (Clifferty Calleja) gained its first win in Malta after overtaking Udjo Du Gilwesk (Jesmond Attard) in the final metres. The programme ended with another race from the same category. Here it was Finnish Zacarias Kemp (Jesmar Gafa’) which grabbed its third win in a row after sustaining the challenge of Big Finish (Noel Baldacchino) in the final straight. Another meeting at the Marsa Racetrack will be held on Sunday. The first race should start at 1.30pm. Race 1. Class Silver – Evisir (Redent Magro) – 1.14.2”. Race 2. Class Silver – Angelus Del Phedo (Raymond Schembri) – 1.15.8”. Race 3. Class Silver – Viking De Braye (Noel Baldacchino) – 1.14.2”. Race 4. Class Silver – Trytocatchme (Charles Camilleri) – 1.15.8”. Race 5. Class Silver – Energitj (Kurt Saliba) – 1.15.6”. Race 6. Class Silver – Peanut Butter (Noel Baldacchino) – 1.15.4”. Race 7. Class Premier – Brigadoon (Julian Farrugia) – 1.13.3”. Race 8. Class Silver – Utian Joy (Clifferty Calleja) – 1.13.5”. Race 9. Class Premier – Jaguar Broline (Clifferty Calleja) – 1.15.2”. Race 10. Class Silver – Zacarias Kemp (Jesmar Gafa’) – 1.14.4”.